Cinnamon is a spice obtained from the inner bark of several trees from the genus Cinnamomum that is used in both sweet and savory foods. The flavor of cinnamon is due to an aromatic essential oil. - Cinnamon is widely used as a spice. It is principally employed in cookery as a condiment and flavoring material. 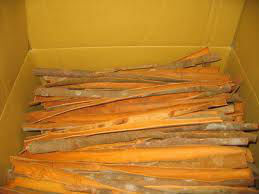 - Cinnamon has been proposed for use as an insect repellent. Cinnamon leaf oil has been found to be very effective in killing mosquito larvae. Cinnamon is used in traditional medicine: has effect on HIV-1, inhibite the replication of the virus causing herpes in vitro, control blood glucose levels, inhibits development of Alzheimer’s disease, etc.